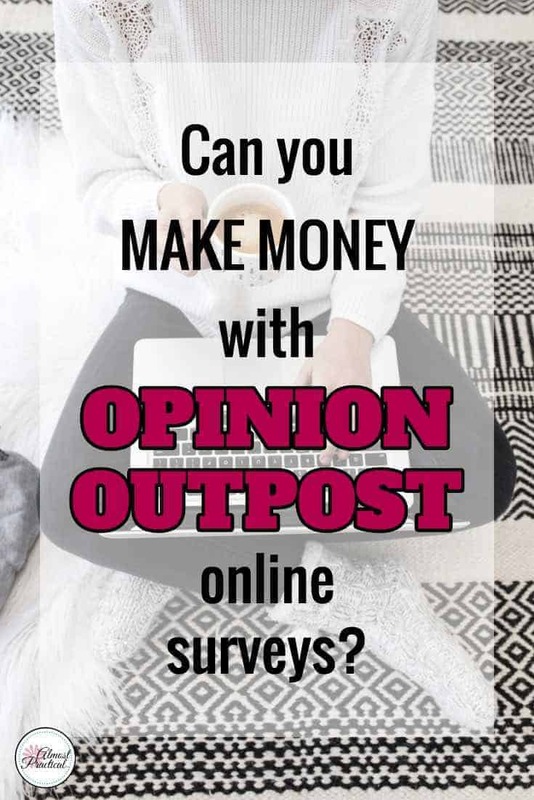 Recently I have seen a lot of posts saying that you can make money with Opinion Outpost online surveys. Since I am always looking for ways to make money online – surveys seemed like an easy thing to do in your spare time. So, took Opinion Outpost for a test drive and this is my two cents. Whenever I look at make money online opportunities, my sixth sense is always in high gear. I don't want to be part of a scam and I certainly don't want to waste my time. So, why would people pay you to take a survey? The main reason is market research. Every company needs market information so they can create products that the public wants. Nobody wants their next great product to be a flop. One of the ways they do this research is to ask people about their opinions. They hire a survey company to do send out surveys and get the information needed to develop the product. So, no – I don't think that online surveys are a scam, in general. However, it is your job to evaluate the reputation of the survey company you choose to work with. When I signed up with Opinion Outpost, I wasn't sure how it would work. The sign up process was fairly straightforward. Once you set up your account, the first thing that you do is take a survey (of course!). The first survey is all about you – because they need to know a little bit about who you are so they can match you up with the right surveys in the future. Once you finish the initial survey, you can start taking other surveys. First, you take a “pre-qualification” survey so they can decide if you are a good fit. If you meet their criteria then you take the full survey. Each survey worth a certain number of points. When you complete the survey, these points get credited to your account. Once you accumulate a bunch of points, you can cash them in for a variety of different gift cards or for cash to your Paypal account. Each type of payment has a different minimum level of points. So, you can cash in for a gift card with around 30 points but for PayPal you will need 100 points. At the time of this writing, each point is worth 10 cents. Can You Really Make Money With Opinion Outpost? Yes, you can make money with Opinion Outpost. But, it is not a get rich quick kind of thing. It's a nice side hustle to do in your spare time for a little extra cash or fun money if you will. Making a full time income with Opinion Outpost is not realistic. The thing that surprised me the most in my test run of Opinion Outpost, was how long each survey took. First, you do the pre-qualification survey – which takes a few minutes. And sometimes you don't even qualify – so you don't get any points – but you do get an entry into a drawing for a $10,000 prize. If you qualify, then the actual survey can take upwards of 15 minutes. The actual questions can be a little mentally draining too. They often ask the same question in many different ways. For example, they might ask if you did some specific thing in the past year, then maybe how often did you do it, etc. So, to deliver your honest answers – you really need to think and dig into your memory about things you've bought, your habits, your likes and dislikes, etc. I believe that there also may be a limit on the number of surveys you can take daily – so you can't binge survey, if that is a thing. This video has some great Opinion Outpost tips and tricks for making the most of your survey experience. Taking online surveys with Opinion Outpost is an easy way to make a little extra money. Another good company for making money with online surveys is Swagbucks. You can learn more about them here. One of my favorite ways to make money online is through blogging. This free eBook – Boost Blog Income by Ruth Soukup – explains more about how bloggers make money. It's an excellent resource as well. If you have been thinking about starting a blog – you can find answers to some common questions here. And, if you already have a blog check out this massive list of 20+ Affiliate Programs that you can join now to increase your blog profits. Thanks for this information! I’ve always wondered whether those surveys were worthwhile. And I’ll definitely be checking out your Affiliate Program Directory when I have some more time.